It's been more than a month on the salads and with our necks in the fruit bowl for the Special Projects Bureau's elite post-pub nosh deathmatch team, following the mealy pudding v migas clash of titans. We reckon our arteries have recovered sufficiently to make another foray into the calorie-packed world of nourishment designed to mitigate the worst effects of a night on the sauce, so let's get to it. 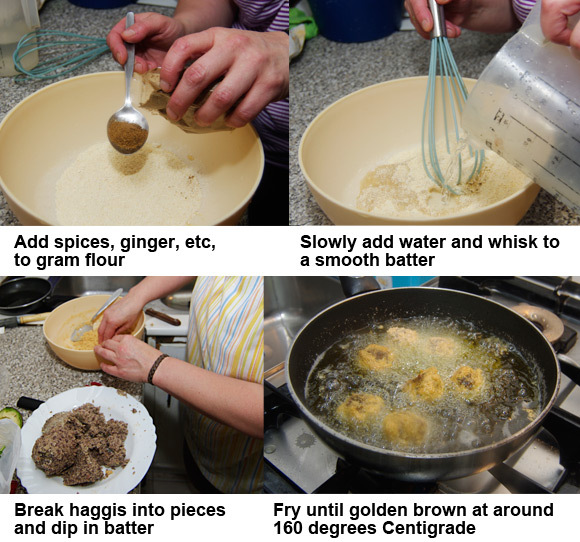 Our first contender sees a return to north of the border with haggis pakora, which is a highly improbable Indo-Caledonian alliance making use of the Scots' most potent culinary weapons: sheep pluck and deep-fat frying. Fans of Indian food will need no introduction to the pakora concept - traditionally vegetables, such as spinach, or fresh cheese, fried in a gram flour batter to make palak pakora and paneer pakora, respectively. We gather the Scottish are a bit fond of pakora, so the haggis variant was an inevitable carnivore-friendly excursion into international fusion cuisine. Having assembled the necessary ingredients (see below) for this slightly unholy dish, we headed to Bar Almanzor in my local town of El Barco de Avila, where owners Juanjo and Begoña were ready as ever to lend a hand. It's a round of applause for Begoña this time round for doing the actual cooking, freeing Juanjo to prevent inquisitive nippers from dipping their fingers in the chilli powder. 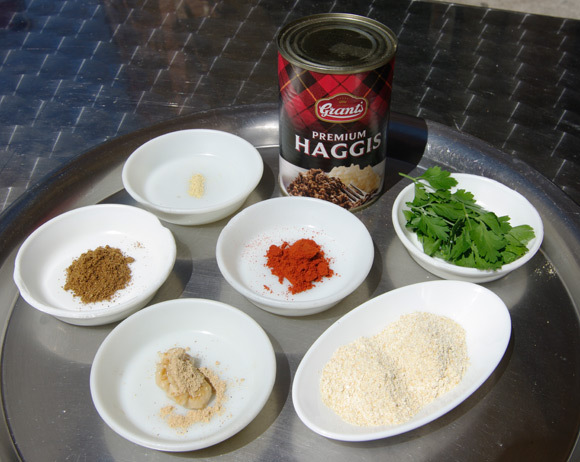 You will need, seen here clockwise from top: 500g or so of Haggis, a handful of chopped coriander, 150g of gram flour, one teaspoon of garlic and ginger paste, half a teaspoon of Garam Masala, a pinch of fenugreek and (centre) half a teaspoon of red chilli powder. You'll also need a teaspoon of salt. As you'll have noticed, haggis is a bit hard to come by round these parts, so I'm obliged to fellow SPB operative Bill Ray for posting me the tinned variety. 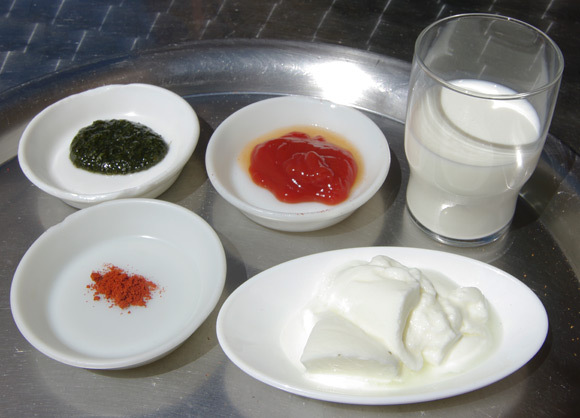 ...200ml of yoghurt, 150ml of tomato sauce, one teaspoon of mint sauce, quarter of a teaspoon of red chilli and and 50ml of milk. Add one teaspoon of sugar and half a teaspoon of salt to your list and you're good to go. Getting the consistency of the batter just right is a matter of trial and error, and you should add the water with caution. 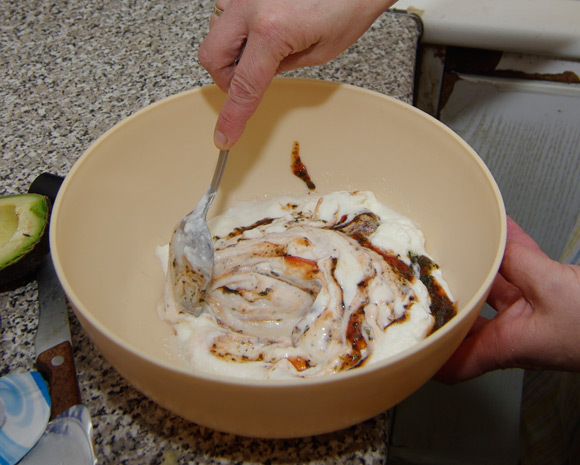 If the batter drips off the end of a spoon, you've overdone it. It should hang in the air, without being too thick.